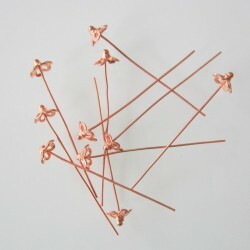 This category contains Copper head and eye pins in various gauges and lengths. Copper There are 2 products. 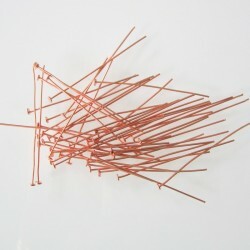 A pack of 50, Copper head Pins with a clear anti tarnish coating. They are 50mm long, with a 3mm head and are made from 22ga copper wire. A pack of 10, Copper head Pins featuring a Flower Bead Cap and a clear anti tarnish coating. They are 50mm long, with a 8x6mm flower bead cap and are made from 22ga copper wire.